Home > News > Form 5 & 6 > Quality Quicksticks Hockey! 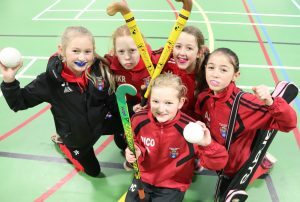 Congratulations to our U11 girls hockey team who topped the tables in the Oakbank Partnership’s Hockey Festival back in December. Phoebe R, Phoebe C, Juliet, Heidi and Jemima, all in Form 6, worked wonderfully together in the 4-a-side Quicksticks tournament. They played 4 teams and won overall. The girls have qualified for the Bradford Winter finals which will take place in February! Well done to our wonderful sports stars!